YOGA & WELLNESS: On Living W.E.L.L. I've been thinking a lot about my path the wellness recently. Why it is that I've chosen to share it with the world, why I want to teach and write about yoga, and to love wildly... Why I've made the choice to choose love over fear, every damn day. I've come to realize that taking care of + caring for others has always been second nature, but caring for myself unconditionally is a rather new concept for me. Though it's one that I've embraced wholeheartedly. The last few weeks (as I deal with the final leg of my immigration to the USA), have been really challenging. I've been anxious, frazzled, frantic, and at moments - broken-hearted, and oh so sad. It's been incredibly comforting to lean into my practice. To return to this place, not only when things are great, but when they all fall apart as well. To come to the mat, without judgement or expectation. Where there are no rights or wrongs, or immigration statuses, or paperwork... The place where I'm allowed to move + breathe + play + just be. Not a place to escape to, but rather a place to feel it all + let it all go. I'm learning to accept the things that I can not change. To enjoy the little things - a backbend with a smile, the leaves in mid-October, a matinee with an old friend... And I'm doing my best to navigate this crazy journey, with my (open) heart as my compass. How are you taking care of yourselves? Do you need some ideas? Meditate, get on the mat, treat yourself to a massage, eat nourishing foods, go for a hike in the woods, play with your pup, take a workshop, start a project - get inspired! Or why not come hang at the W.E.L.L. Summit with the Mass Musings Tribe? 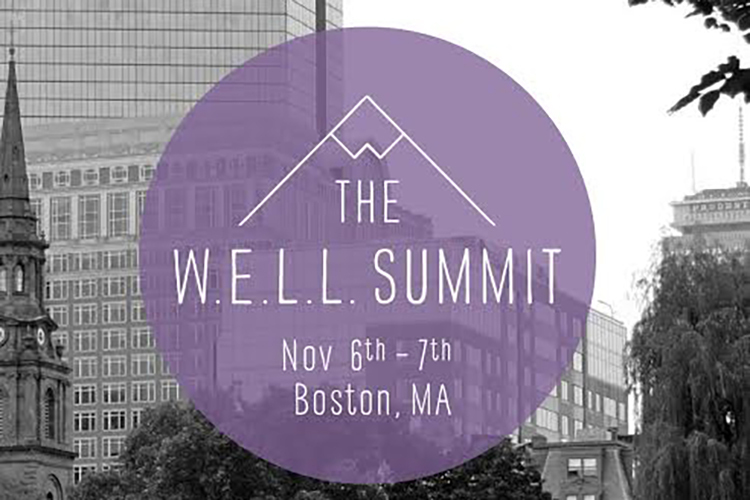 My friend, Kayte (from Mass Musings), and I will be there, living W.E.L.L., from November 6 - 8! What is the W.E.L.L. Summit? Let me tell you! It's an urban weekend wellness retreat, taking place in the heart of Boston. Come practice, listen, play, eat, grow, and learn with some of the most inspiring and open-hearted individuals in the wellness field. I'm really looking forward to nourishing meals, morning yoga, and taking some extra time for myself after the chaos that has infiltrated my life. I'm looking forward to slowing down, and doing the work. Photo Credit, Jordan Ferney of Oh Happy Day! I'm super excited for the Breakout Session speakers! My Instagram idol, Ksenia Avdulova, who you may know better as the acai aficionado, Breakfast Criminals, is talking all about using social media to market your business. She's super awesome, and I'm really hoping I'll get to chat Brazilian superfruits and heart bowl love with her. Brandie Gilliam, Founder and Creative Director of Thoughtfully Magazine, will also be attending as a business expert. As a graphic designer, yoga teacher, wellness enthusiast, and aspiring writer - it's safe to say that I love Thoughtfully Magazine. I was so thrilled when they made my fav @yoga_girl, Rachel Brathen, made the Issue 3 cover - and they didn't photoshop her image. How refreshing is that? I'd love to hear more from this lady and her inspiring project. So what do you say? Want to join in the fun, my fellow wellness warriors? There are three ways to attend, Full Experience, Weekender Pass, and Weekend Warrior Pass. Get your own all-inclusive ticket at a discounted price, just for Mass Musings + YYZ->BOS readers! For more updates and information, check out the W.E.L.L. Summit Blog! Hopefully I'll see you at the Summit!